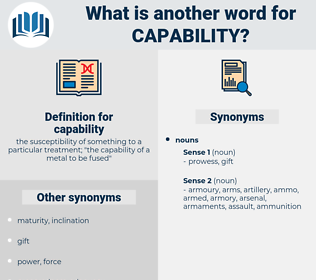 What is another word for capability? the susceptibility of something to a particular treatment; " the capability of a metal to be fused"
Duties, tools, tasks, inputs, modes, assignments, methods, instruments, units, approaches, processes, functionality, avenues. capacity-, functionality, inability, faculty, viability, affordability, option, eligibility, scope, feasibility, calibre. possibility, wherewithal, prowess, availability, proficiency. incapacity, inefficiency, inaptitude, lack, inability, weakness, incompetence, ineffectiveness, incapability, ineptness, impotence. uselessness, deficiency, inefficaciousness, maladroitness, defectiveness, imbecility, disablement, paralysis, inadequateness, feebleness, awkwardness, ineffectuality, stupidity, inefficacy, dulness, reality, ineffectualness, Incapacitation, debilitation, disability, helplessness, certainty, actuality, impairment. And thus, instead of dying, she began to live, for what is life but growth in experience, in strength and knowledge and capability? Those who have the capability should, if they feel disturbed, work out the argument. 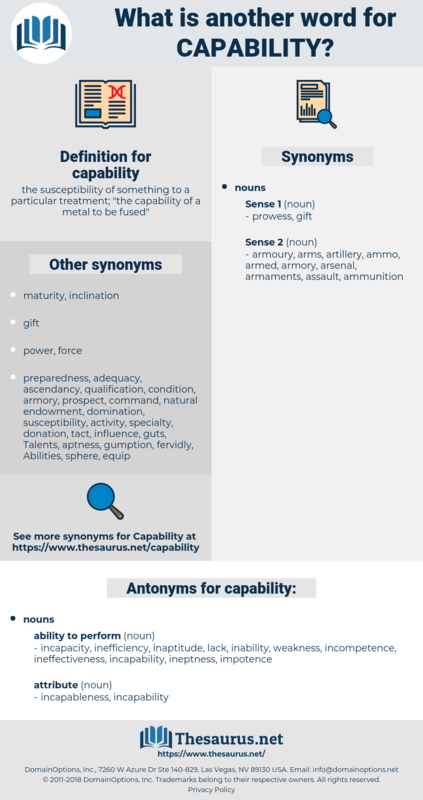 military posture, strength, Defensibility, capacity, operating capability, associableness, performance capability, executability, associability, overkill, military capability, military strength, posture.